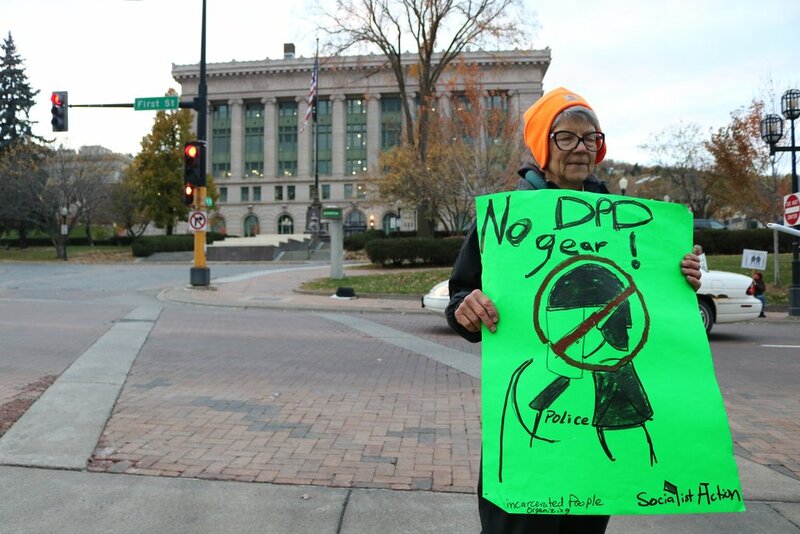 On Monday Oct. 22, Duluth City Council Members approved the purchase of riot gear for the Duluth Police Department. Before the approval, protests, both reportedly peaceful and hostile, ensued on campus and at the Duluth City Hall in the City Council Chamber. Mid-Monday morning UMD students protested peacefully by marching through campus and speaking on the topic at the Garage in the Kirby Student Center. Students held signs that read “Black Lives Matter” and “Keep Duluth Riot Gear Free” as speakers were introduced, speakers like Tyra Jaramillo who helped organize the UMD protest. Students for Justice, who helped orchestrate the on campus peaceful protest, welcomed students to speak freely and allowed them to express their opinions, many of which were rooted from racism and police brutality. People were hurt emotionally. This same pain was expressed outside Duluth City Hall Monday evening as well. Numerous protesters gathered at the Duluth Civic Center on West First Street displaying their signs against the riot gear to passing motorists. One outside peaceful protester was Duluthian Doris Malkmus. Malkmus stated that the Duluth Police have come a long way from being “antagonistic” and said they are more like partners with people who are homeless. According to Malkmus, the police department has hired someone who keeps tabs on about 116 homeless people in the community every night. As the six-o'clock hour approached, many protesters made their way into City Hall to display their signs to City Council Members. The masked protestors approached the city councilors while chanting “No line three! No riot gear for the DPD!” and stated that they’ve rebelled against the idea of riot gear before but the councilors chose to ignore them. City Council Member Zack Filipovich asked them to wait twenty minutes until their Finance Committee meeting adjourned and was ignored. After multiple attempts, Filipovich passed the floor to council member Joel Sipress. In saying this, the protesters hoped to prevent City Council Members from meeting. The same masked protester also stated that the militarization of our police will not make us any safer. The protests continued for about twenty minutes until the city council members returned to conduct their meeting, which was slated for seven p.m. Protesters then moved behind city council members who operated their meeting over the chants by shouting into their microphones. The once quiet room had erupted into an arena of vocals. Jaramillo stated that the peaceful protest held at UMD was to show that college students cared. “We wanted to have our voices heard,” Jaramillo said. According Jaramillo, students just chose to attend the City Hall protest thinking it would be another peaceful way to express their voice. Students for Justice didn't organize the protest at City Hall. Jaramillo stated that she agreed with the sentiment, when talking about the City Council Chamber protest but expressed disappointment in the implementation. Jaramillo mentioned that Duluth hasn't had a real riot in nearly 100 years and questioned why the city needed gear now. According to Jaramillo, the best way to have your voice heard is to get out and vote. Jaramillo stated these protests are less for changing the council’s minds, “which is difficult to do,” but more to show who will be voting and who the city council will be representing. According to an article published by the Duluth News Tribune, the Duluth Police Department plans on purchasing around $83,700 worth of riot gear and another $41,500 worth in 2019. The riot gear the police are looking to purchase include helmets, leg and knee pads, chest protectors, elbow pads and other protective equipment. Despite all the protests, the motion to approve the purchase of the riot gear was approved six to two, with Gary Anderson and Joel Sipress in the minority. We reached out to City Council Member Zack Filipovich for a statement but he would not give a comment.